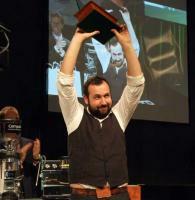 Congratulations to Stephen Morrissey, who’s taken top honors at the WBC in Copenhagen! The news is all kinds of awesome… couldn’t have happened to a nicer guy. ‘Course, it’s nothing but great news, too, for Square Mile Coffee, the much anticipated partnership between Stephen and the 2007 WBC winner, James Hoffman. Honestly, I’m going to have to make a trip ‘cross the pond just to try their coffee. He trained James Hoffmann for last year’s WBC. He trained Kyle Glanville for the USBC, which he went on to win. He won the Irish Triple Crown of the Irish Latte Art championships, the Irish Cup-Tasting championships, and the Irish Barista Championships. And now, in his first ever appearance in a World Barista Championship, he was crowned the World Barista Champion. This man is unstoppable.